It’s amazing to think that January is almost over, and before we’ll notice it, it’ll be time for summer sandwiches. But while it’s still cold outside, why don’t we take a look at a fresh sandwich to warm your insides during the cold months to come? 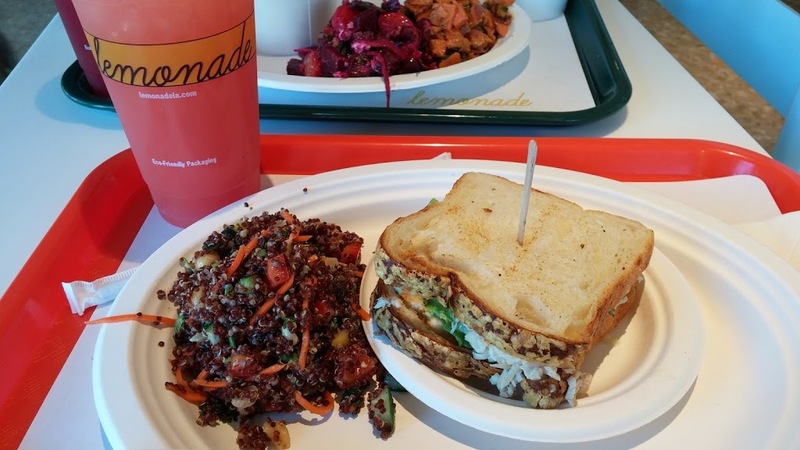 In the LA area, there is a fantastic chain of cafeteria-style eateries called Lemonade. 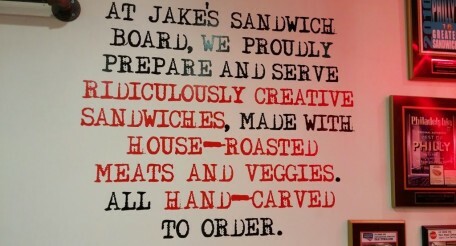 I’ve been to the one in Beverly Hills a long time ago, but even then I hadn’t tried one of their sandwiches. 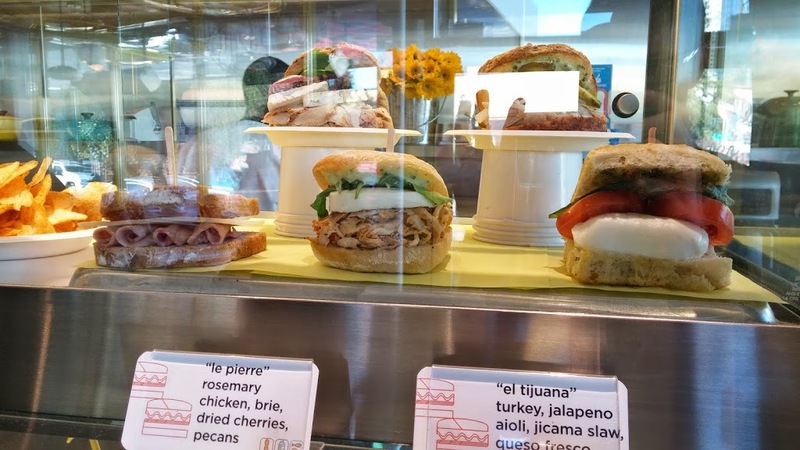 Recently though, a location opened up close to where I live in Toluca Lake, making it all the easier to stop on by for a quick lunch to try some of their amazing offerings. Your first time inside of Lemonade may be a bit overwhelming. Sure the decor is simple, stylized and welcoming with its bright colors, what’s going to throw you for a loop is the number of amazing selections waiting for you when you jump into the lunch line. At the start of the line you will see a long line of various salads to add to your lunch. I picked the Thai quinoa salad one that is combined with cucumbers, red pepper, mango, peanuts and carrots. There’s a bit of bite to this and a mild bright flavor that would make this a great combination with a number of offerings at Lemonade. After the burden of deciding on which delicious side salad to have, the real challenge of the afternoon began: which of the numerous sandwiches should I choose. All look delicious, and all are on display along the lunch line. If the words weren’t enough to help you pick one from many, then looking at all of them won’t make your decision any easier. After much debate, I settled on the El Tijuana: turkey, jalapeno aioli, jicama slaw, and queso fresco. While the sandwich could be toasted to order, I left that part alone and the bread stayed with me until the end. A little bit of cheese crusted onto the side with a whole-grain flavor made this an excellent bookend to the delight inside. The turkey was fresh, with a mild flavor and thinly sliced. The jicama slaw added some bite and fresh flavor while the jalapeno aioli brought the spice kick this sandwich needed to propel it further. The queso fresco, for those who have not heard of it before, is a mild white cheese and in this case it’s shredded and put on top of the turkey. It’s a nice, mild addition to the flavor that brings the fresh and spicy flavors of the slaw and aioli more into line with the turkey. A delicious lunch, and that doesn’t even count the amazing lemonade options (all sound fantastic though I went with Blood Orange) and the desserts. Frankly, you may lose half of a paycheck here in an afternoon. 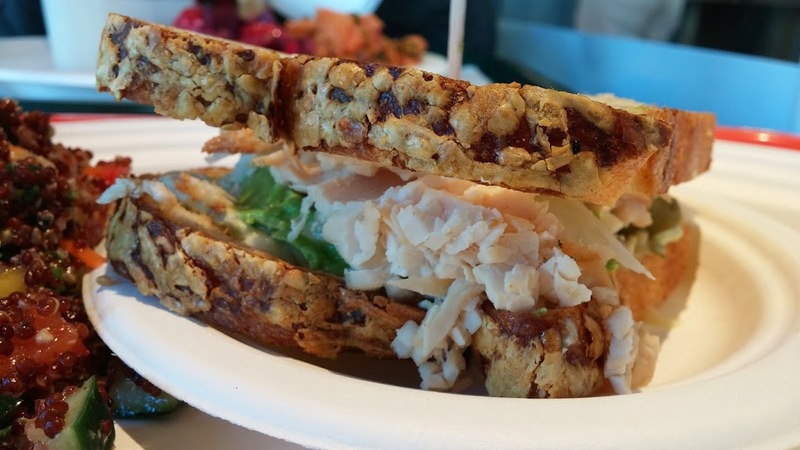 Whether sitting outside on the gorgeous patio overlooking Toluca Lake, or the inside with its modernized cafeteria look, you really can’t go wrong stopping in at Lemonade. It’s a place where the delicious options will have you coming back for more in the future until you try nearly every of the innumerable options in front of you. What's On The Sandwich Board?